Jim is worried as there is still no sign of Hilary arriving for the wedding, and he says that he's starting to get a bad feeling about the day. Paul and Lucy wind him up reminding him about Eileen Clarke's disastrous wedding day. Jim does not look happy. Scott is moaning about having to do all the gardening work now that Henry has a bad back, while Henry just tells him he should have hurried as they're running late. Charlene is more worried about Madge, as today should have been her wedding day, and what with Jim and Beverly getting married as well as all the Valentine's Day cards floating around the street, it must be hard for her. Henry comes up with an idea though and ropes Charlene into help. Harold can't afford a Valentine's Day present for Madge so he has picked some flowers for her from Mrs. Mangel's garden and is wrapping them up for her. 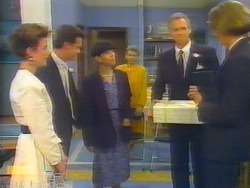 Mrs. Mangel doesn't seem that happy about this and warns Harold not to make a habit of it. Mike turns up with a Valentine's Day present for Jane. 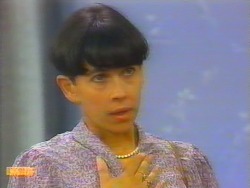 He says that Mrs. Clarke really isn't coping with things, and Mrs. Mangel says that she will go over and look after her, as she needs her friends around her at a time like this. Jane is also worried about Madge. 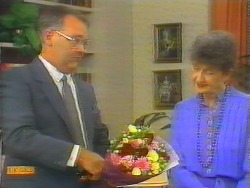 Harold gives Madge her flowers, but she looks annoyed when she hears where they came from. Henry and Charlene turn up saying that someone has left a box of chocolates outside for Madge, and start teasing her that she has a secret admirer. Harold gets crosser and crosser about this and then accuses Madge of leading on Rob Lewis again. He nearly explodes when Henry and Charlene say it could actually be the milkman, but Madge tells him that they're only kidding, and they admit that the chocolates are from them to say that they love her, which really cheers Madge up. Jim comes into the living room, which has been set up for the wedding, and Lucy fixes his buttonhole for him. 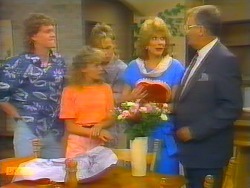 Hilary finally turns up with Beverly's nephew and niece Todd and Katie, in tow, but without her sister Annette. She is horrified when she hears that the ceremony is to be held at no.26 rather than a church, and comments that it is “another sell out to the trendies”. She won't say why Annette hasn't been able to make the wedding, and Jim senses trouble. Paul and Gail arrive and are introduced to the celebrant. Hilary is very cold towards the celebrant, saying that she prefers the real thing, and then makes a few pointed comments towards Paul and Gail, saying that the only thing nicer than a wedding is a christening. Gail tells her that there is nothing to report yet. Hilary then asks about Gail's father Rob, and upon hearing that he won't be making the wedding, makes a comment about some people not being able to handle family get togethers. 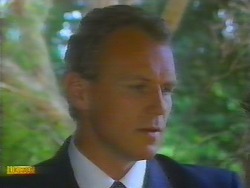 Paul mutters under his breath that he wonders why, and pulls Gail away. Meanwhile, Helen is explaining to Jim that Annette was unable to come because of serious domestic problems. Madge, Harold and Henry turn up, and immediately Hilary tries to get Henry to stand up straight, which hurts his back, even more. She then offends Madge by making remarks about her cancelled wedding, and Madge's “thrown together outfit” whilst commenting that her own dress is an original. Mrs. Mangel is fretting because her dress was the one she was supposed to wear to Eileen's wedding, and she doesn't want to upset her. She also thinks that it isn't right for Jim and Beverly to get married today, but Jane calms her down and reminds her that today is supposed to be a celebration. Lucy is trying to talk to an unresponsive Todd and Katie about things, and asks them about their mother but Todd tells her to shut up and refuses to answer any of her questions. Helen calls them in, and Lucy tells her that she is trying to get on with them but its difficult. Everyone is sitting down ready for the ceremony, while Henry passes around the champagne and jokes about being like Quasimodo with his hunched back. Paul tries to talk to Todd but gives up when Todd is rude to him. 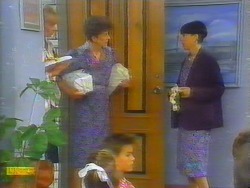 Hilary is horrified when Mrs. Mangel turns up wearing exactly the same dress as her – much to Madge's delight. 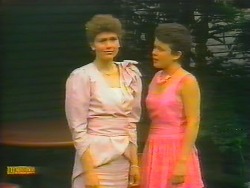 Mrs. Mangel is mortified, but Jane won't let her go home and change. Madge and Mrs. Mangel have a slanging match, with Mrs. Mangel reminding Madge about her cancelled wedding day, and Madge retorting that Mrs. Mangel should have had more sense that to come to a wedding as mutton dressed up as lamb. Jane and Harold have to separate the pair as Beverly turns up outside. Hilary tells Beverly she looks a mess, and fiddles around with her dress while Mike is trying to take photos. 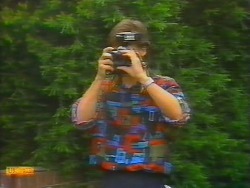 She says that she'll tell Beverly all about Annette later on, and then warns Mike not to take any photos with her and Mrs. Mangel in the same shot. 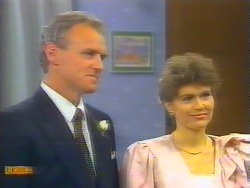 Jim and Beverly say their vows, and everyone claps as they kiss each other. 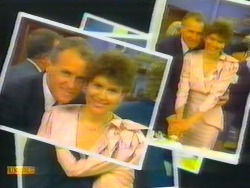 Jim then explains that Paul and Gail want to use this opportunity to renew their own wedding vows. As they get up, Paul murmurs to Gail that this time they mean it, and she replies that they meant it the first time, but they just didn't know it then. As Paul and Gail begin their renewal of vows, Todd takes Hilary's car keys from her bag, and he and Katie slip out unnoticed to get their bags from her car. PAUL: I promise to respect you and to love you; to treasure your independence and your uniqueness as a human being; to be there when you need me and to keep the faith. To be your husband. GAIL: I promise to share with you the good times and the bad; to respect the times you need to be alone and to share the joys of being together. To care for you and to be cared for; to comfort you and to look to you for comfort; to love you and to be loved. To be your wife. Todd and Katie run off down the street as Paul and Gail kiss, and the celebrant laughingly asks if there is anyone else. Harold chuckles until he sees the look on Madge's face. The party gets into full swing as Hilary questions Paul and Gail about renewing their vows, saying that once should be more than enough. However Helen tells them that although others might think it's a token gesture, she knows the real reason why they did and that she's very proud of them. 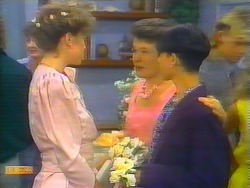 Hilary tells Beverly that Annette wasn't allowed to come to the wedding by her husband, and that they've been arguing which has upset the kids a lot. They then realise that Todd and Katie are missing, and go to search for them. 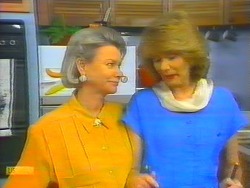 Helen finds Madge crying in the kitchen, and tries to cheer her up. Jim wonders where Beverly has gone, as he wants to surprise her about their honeymoon – a river cruise. Paul jokes that it's the only place to get away from Scott and Henry and their practical jokes with the shaving foam. 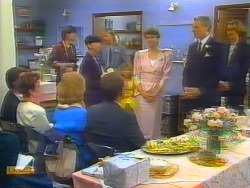 Mrs. Mangel points out that the bride is outside in the street, and Jim goes out to find her, only to be told that Todd and Katie have run away.